As mobile payments continue to become more commonplace among retailers, smartphone consumers are already showing a pretty strong appetite for mobile shopping on their devices. According to a June 2012 survey among 5,000 Android and iPhone users in the U.S., Nielsen found that 47% of them have used a native shopping app on their phones. 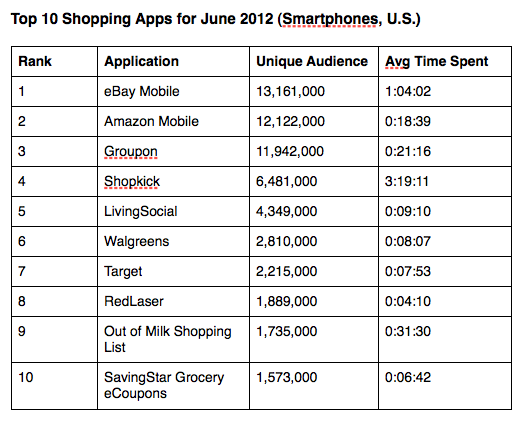 The analysts say that in total some 45 million U.S. consumers have used shopping apps, on average, 17 times in the month. In terms of what apps are “selling” the best, the strongest players on mobile are those that are strongest online, with eBay, Amazon and Groupon the top three mobile shopping sites at 13.2 million, 12.1 million and 12 million unique users respectively. But, when it comes to time spent on those apps, it’s the less-popular Shopkick that is keeping users engaged the longest. Shopkick, which bridges the physical and mobile experience by offering users deals while in-store, attracted 6.5 million uniques in the month to rank fourth, but its app proved to be a very strong magnet for usage. It was on average used for over three hours in the month, three times more than the most popular app in terms of unique users, eBay Mobile (which ranked second in terms of time spent). Nielsen, unfortunately, doesn’t detail which apps brought in the most revenue. It would potentially be a misleading comparison, however, given that the top ten not only includes auction site eBay and online marketplace Amazon, but daily deal sites like Groupon (2nd) and Living Social (ranked 5th, 4.3 million uniques); mobile apps for physical stores (Target: ranked seventh, 2.2 million uniques); promotions like Shopkick’s; and organizing apps like Out of Milk (ranked ninth; 1.7 million uniques). Some of these apps don’t give users the ability to make in-app purchases, although this appears to be the direction that everything is converging: even if it’s not a functionality that an app will offer on its own steam, it will integrate so that people can do that seamlessly no matter what they are doing on their phones. It looks like this will continue to grow over time: “Retailers are finding that consumers are willing to use smartphone apps to enhance their shopping experience, and this data shows usage of shopping apps is growing,” Don Kellogg, director of telecom insights at Nielsen, noted in a statement.